Apollo from the London Cycling Campaign collecting signatures at the junction of Howland Street and Cleveland Street for Love London, Go Dutch. 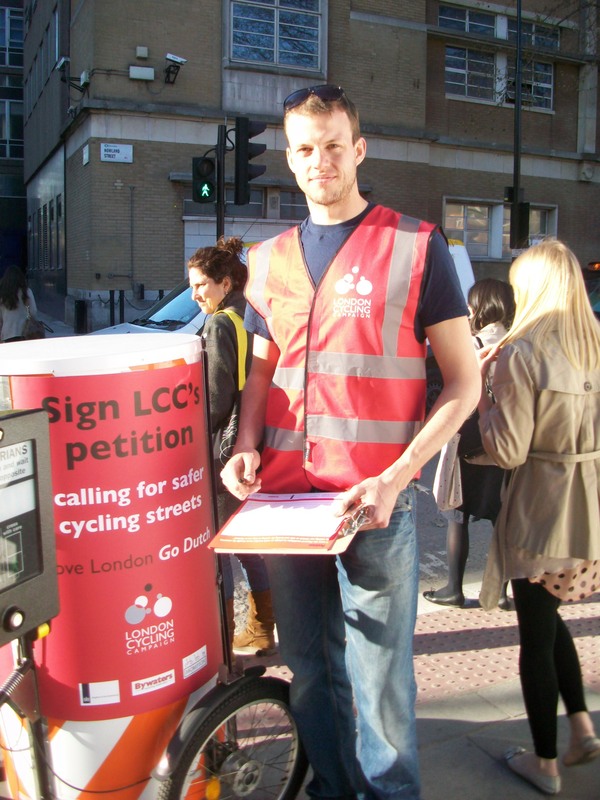 The London Cycling Campaign (LCC) spent Tuesday at a road junction in Fitzrovia collecting signatures from cyclists using the east-west cycle route along Howland Street in order to raise the profile of cycle and pedestrian safety. The LCC want cyclists to grab the candidates attention ahead of the forthcoming election for Mayor of London. On 3 May 2012 up to five million Londoners will cast their votes for a Mayor and the LCC want to ensure that "a liveable London, where everyone can cycle and walk safely wherever they want" is high on the political agenda. Philip Benstead from the LCC told Fitzrovia News that the LCC want many dangerous junctions in London to be re-designed so that they are safer so that cyclists can use them without fear of being run over by large vehicles. The initiative is part of LCC’s Love London, Go Dutch campaign which aims to make cycling in London as safe and as attractive as it is in The Netherlands. Video: Philip Benstead explains why they are collecting signatures. London Cycling Campaign: Love London, Go Dutch.